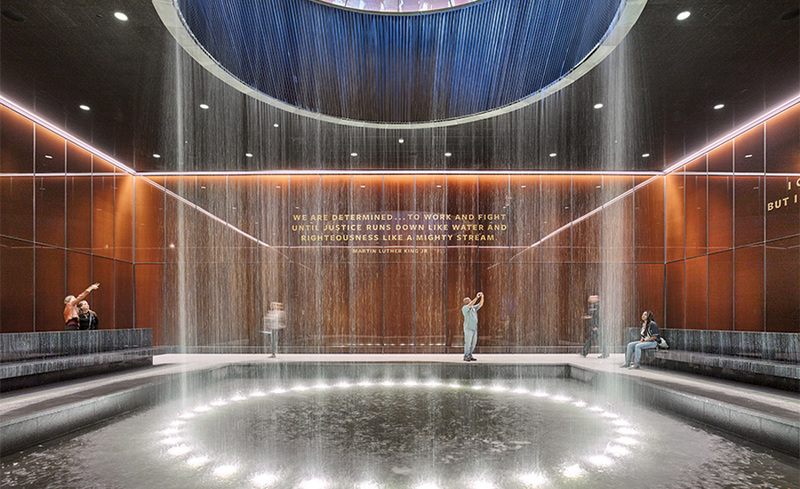 In this month’s version of Inside* we take a look at the recently completed National Museum of African American History and Culture, a career defining project for lead designer David Adjaye. 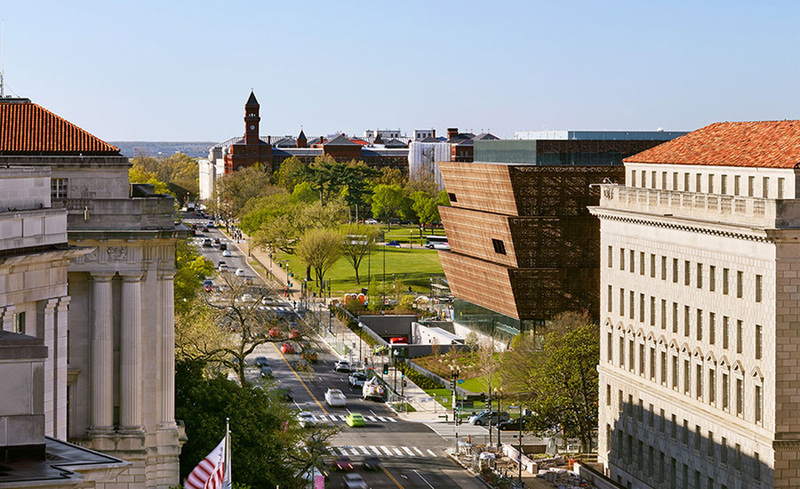 The new museum is located on the National Mall adjacent to the Washington monument and the National Museum of American History. 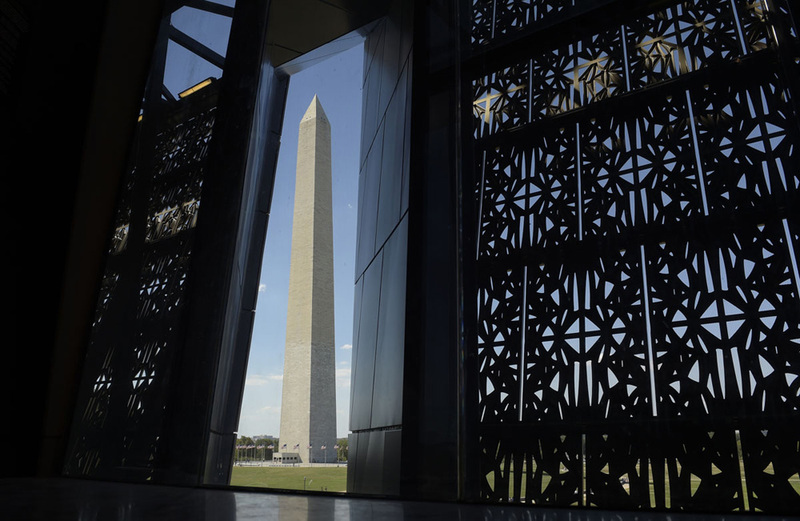 This much overdue tribute to African American people rightly occupies the last piece of land available on the National Mall. The first challenge of this project was how to relate the building to its colonial context both metaphorically and physically. Washington DC is one of the most meticulously planned cities in the world with a powerful spine of architecturally uniform buildings. 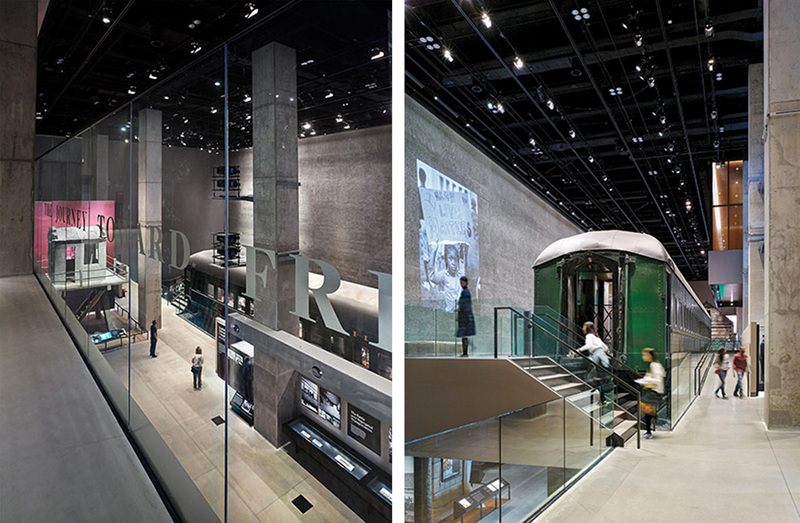 In order to form a distinct identity for the museum, Adjaye chose to contrast the building with its neoclassical neighbours designing a bold yet restrained response. The striking stacked form of the building symbolises a three-tiered crown which is often found in West African art. The actual sculpture which served as the inspiration will also be on display in the museum. The angle of the facade is based on elements of the Washington monument matching the degree of its capstone. The main entrance of the building is located on the south and is defined by a massive canopy which spans over 50m creating a ‘porch’ which acts as an extension into the landscape, bridging the gap between interior and exterior. The underside of the canopy is tilted upwards in a welcoming gesture allowing reflections from the moving water below to shimmer across the surface. 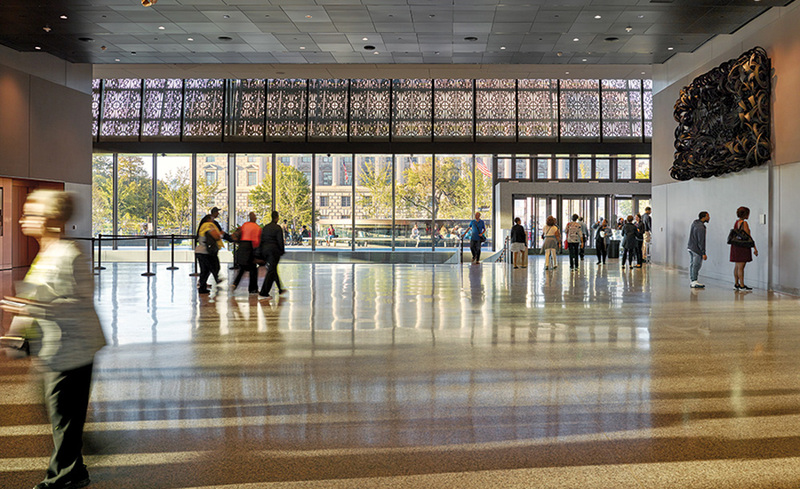 Visitors enter into a vast lobby space known as Heritage Hall and then proceed to the orientation theatre to get the run down on the best way to experience the building and the exhibitions. They are encouraged to start from the bottom and work their way up to the top. 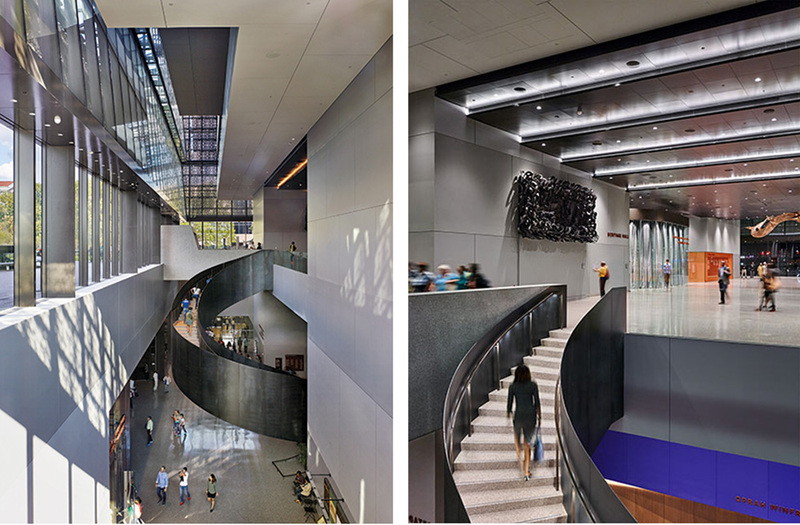 A self-supporting steel staircase links the lobby to the concourse level below. Due to the areas height restriction, the Washington monument, about half of this museum is located underground. This is apt as the dark rooms in the depths of the earth tell the story of slavery and persecution. 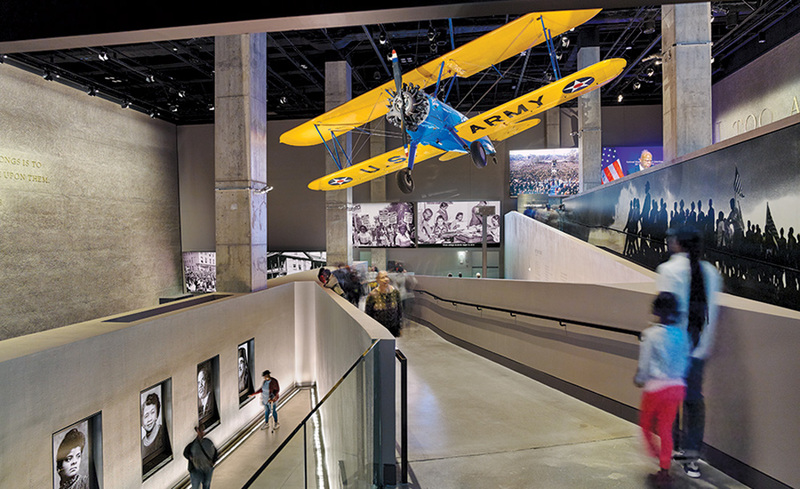 From here the history of African Americans is told chronologically as you ascend the ramps through the triple volume History Gallery. As the building rises out of the ground the mood shifts. This is where the interplay between the two layers of the facades becomes crucial. The dramatic infusion of natural light into the high volume spaces creates an uplifting feeling. 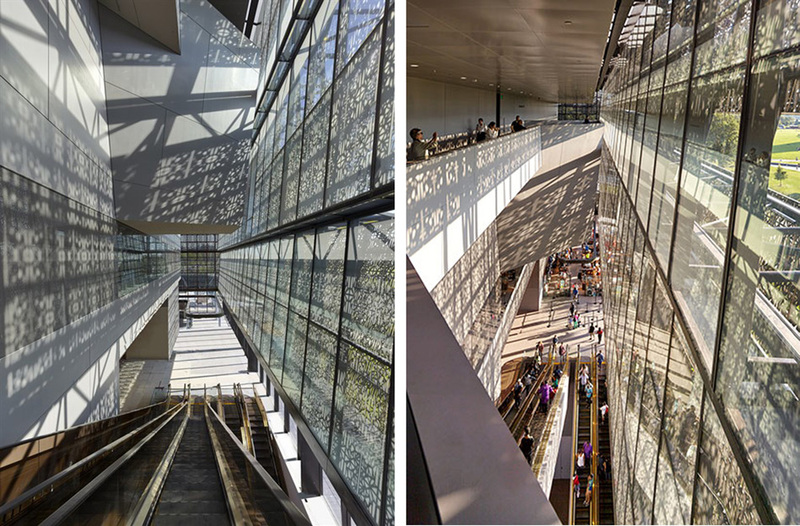 The beautiful dappled light patterns that illuminate the interiors are created by the latticework screen, made of bronze coloured aluminium, which is wrapped around the building to create the three distinct layers. 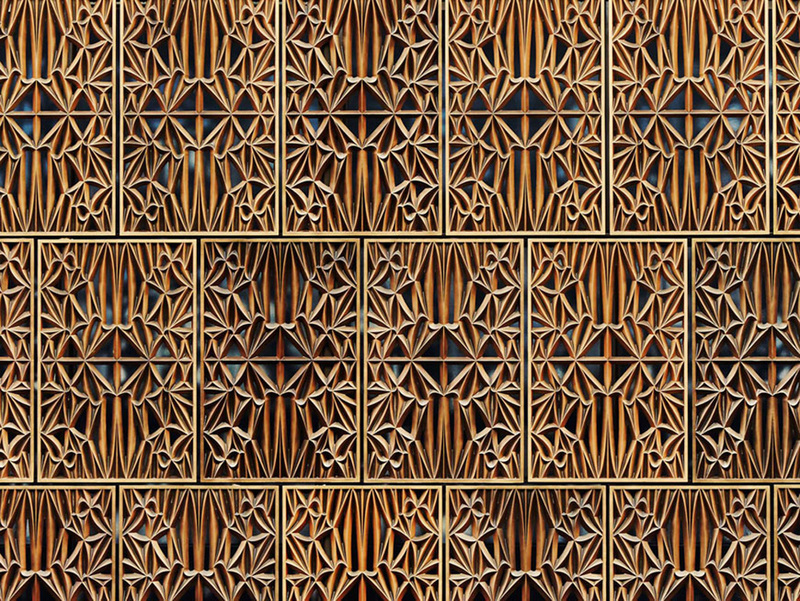 The patterns of this screen pay homage to African American craftsmanship referencing celebrated historical patterns made by ironworkers in the South. The density of the pattern can be adjusted to control the amount of sunlight and the transparency of the screen. 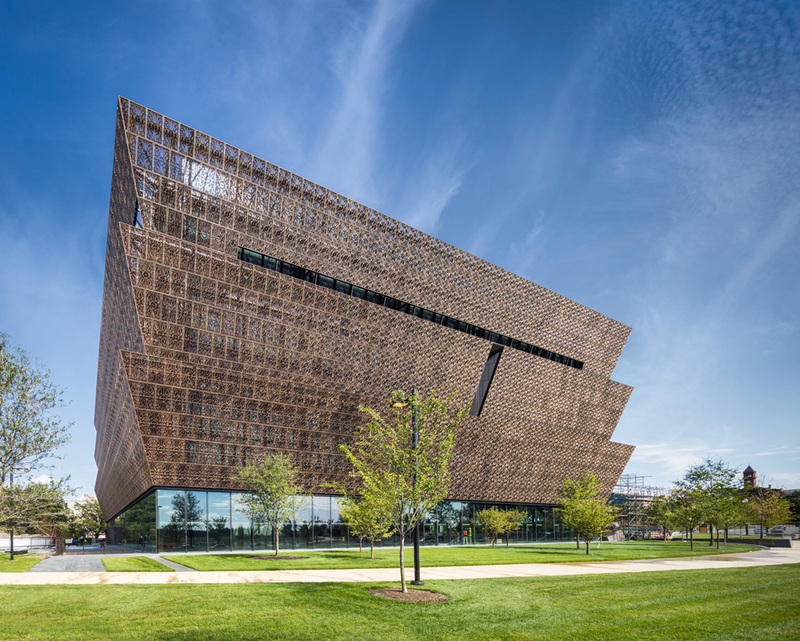 On the upper levels, there are two galleries which are dedicated to culture and community with exhibitions focused on the achievements of African Americans in various fields. As visitors traverse the levels they are afforded strategic framed views of the surrounding monuments of colonial power. The journey ends with an unrivaled panoramic view across the mall fostering a necessary sense of empowerment. 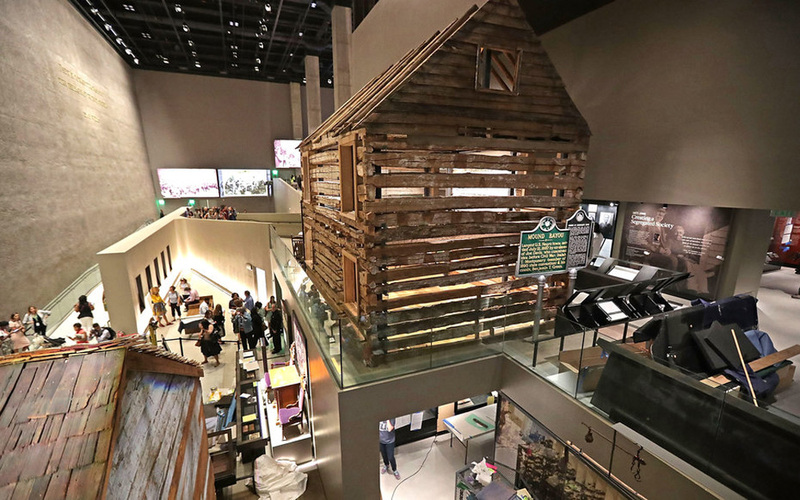 This building is not only a museum. It is also a monument and a memorial. 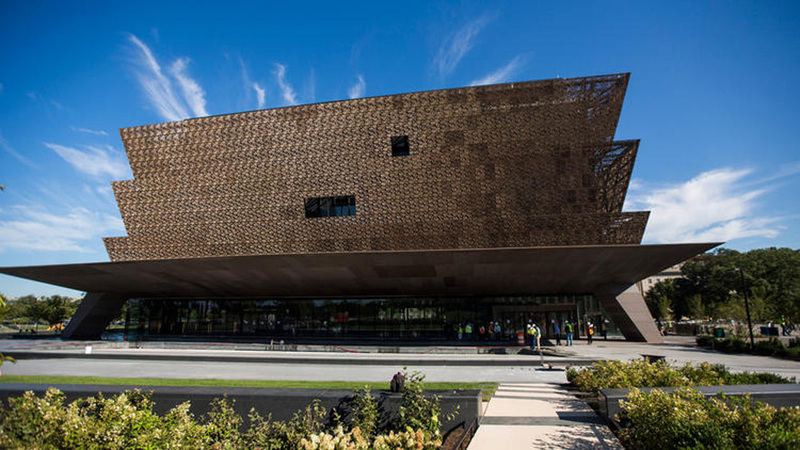 It pays homage to America’s longstanding African Heritage with a piece of architecture which serves as a reminder of the past but also as a beacon to a more just and equitable future.